The acting head of the Helicopter Systems Division at the Australian Department of Defence (DoD) has confirmed that the ADF has begun the transition from the Sikorsky S-70A Black Hawk to the MRH-90, for the special operations forces (SOF) role. 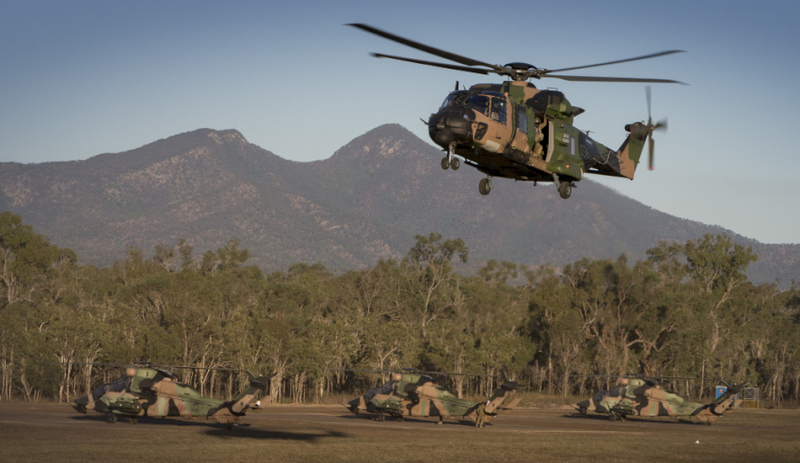 Brigadier Jeremy King said at the IQPC International Military Helicopter conference in London that the ADF is "utterly focused" on developing the special forces role for the MRH-90 Taipan. “The first two MRH-90s were delivered to the special forces regiment on [1 February], at which time two Black Hawks were withdrawn. The focus now is utterly on developing the MRH-90’s counter-terrorist and offshore SOF capability,” said BRIG King. The 20 Black Hawks currently in service in the ADF are expected to be phased out by December 2021. The Army described the MRH-90 as “one of the most advanced tactical troop transport helicopters of the 21st century”, but the acquisition of the aircraft came with hiccups early. BRIG King admitted that the low availability levels and “high rate of effort” to keep the Taipan fleet operational raised eyebrows, but since the helicopter has transitioned to a special operations role, “the aircraft is now performing extremely well”. Australia has ordered 46 MRH-90 Taipans, with the first accepted into service in 2007. Defence describes the MRH-90 as a “fly-by-wire, all-composite construction, troop-lift helicopter with the highest crash-worthy standards. With a large cabin, a rear ramp, weather radar and forward-looking infra-red, the MRH-90 can transport greater loads and carry more troops in adverse conditions”. The Taipan has a max speed of 300km/h with a range of 800 kilometres. data, spares, support and test equipment. When finished, the project will see the delivery of two airmobile squadrons, one special operations support squadron, one maritime support helicopter squadron and a training capability able to provide airmobile and maritime support to the Defence Force from land bases as well as HMA Ships.